Arthroscopy is a procedure that orthopaedic surgeons use to inspect, diagnose, and repair problems inside a joint. The word arthroscopy comes from two Greek words, “arthro” (joint) and “skopein” (to look). The term literally means “to look within the joint.” During shoulder arthroscopy, your surgeon inserts a small camera, called an arthroscope, into your shoulder joint. The camera displays pictures on a television screen, and your surgeon uses these images to guide miniature surgical instruments. 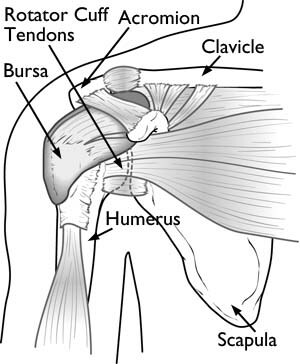 Your shoulder is a complex joint that is capable of more motion than any other joint in your body. Your shoulder is made up of three bones: your upper arm bone (humerus), your shoulder blade (scapula), and your collarbone (clavicle). Your doctor may recommend shoulder arthroscopy if you have a painful shoulder condition that does not respond to nonsurgical treatment. Nonsurgical treatment includes rest, physical therapy, and medications or injections that can reduce inflammation. Inflammation is one of your body’s normal reactions to injury or disease. In an injured or diseased shoulder joint, inflammation causes swelling, pain, and stiffness. Your orthopedic surgeon may ask you to see your primary doctor to make sure that you do not have any medical problems that need to be addressed before your surgery. Blood tests, an electrocardiogram, or chest x-ray may be needed to safely perform your surgery. > Beach chair position. This is a semi-seated position similar to sitting in a reclining chair. > Lateral decubitius position. In this position the patient lies on his or her side on an operating table.